Anyone who watched that match, or even heard of it, will remember it for a lifetime. 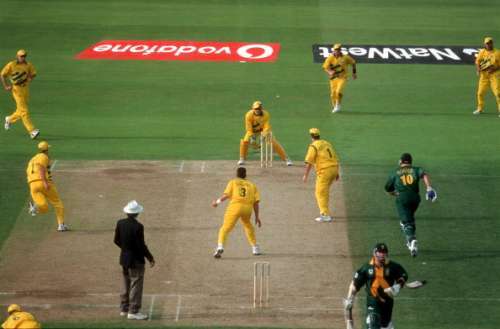 The cricket stadium at Edgbaston has seen many games played on its green grass but perhaps none as memorable as the ICC World Cup semi-final between Australia and South Africa in 1999. As with all matches that live on in memory, this encounter had built up in the minds of cricket fans days before even a ball was bowled. There was the history of the previous match in the competition between the two teams only a few days ago when Herschelle Gibbs dropped Steve Waugh in Headingley. There was also the fact that these two teams were considered the favourites before the tournament had started. South Africa had returned to international cricket less than a decade ago but their rivalry with Australia was already immense. The Kangaroos were on a late tournament winning streak but the Proteas could have ended that. The South Africans should have won this match. If they hadn’t - as usual - choked. No one in the world has been able to explain why the South African cricket team have been succumbing to the pressure of big games for the past 25 years. The ailment doesn’t affect one player or even one generation of players. We can joke that there must be something in the water. Perhaps it is genetically passed on in their DNA. We can only hope that young kids aren’t taught the great choke as they practice in the nets in Durban and Johannesburg. But whatever the reason might be, South Africa’s inability to win important matches in international tournaments has become a truism of sorts. This is the same team that can chase down 434 in a bilateral series but an invisible wall stands in their way in ICC tournaments. Change the players, change the captain, or change the venue. The wall remains indestructible. The most unfortunate aspect of every match that South Africa lose after almost winning is that their self-destruction overshadows every other performance, even from their own team. 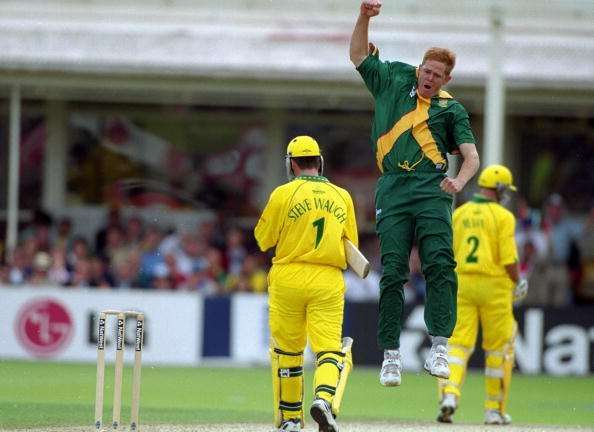 The Edgbaston ODI should be remembered for Shaun Pollock’s bowling spell but it isn’t. Pollock bowled with the hunger of a starving lion that afternoon but his accuracy is simply sidelined in our collective memories. It takes some extra prodding of the brain cells to remember that he sent Mark Waugh, Darren Lehmann, Steve Waugh and Michael Bevan back to the pavilion. He got the two highest scorers in the Australian innings caught behind the wicket and finished with excellent figures of 5/36. He was instrumental in restricting Australia to 213. Pollock is the reason why South Africa would have fancied their chances when they came out to bat. But, of course, no one really remembers his bowling performance. The choke of the second innings is all that remains. We can only hope that people do at least have some memories of Shane Warne’s bowling in that match. His ripping leg-spinner to Mike Gatting in his first Ashes Test is considered to be the ball of the century but the one he bowled to Gibbs was no less in skill or impact. It drifted in the air, pitching outside leg, and then spun wickedly to take the off-stump. Gibbs left the pitch, bedazzled and confused. Warne went on to dismiss Hansie Cronje, Gary Kirsten and Jacques Kallis, all potential match winners. The spin maestro bowled with heart and soul, producing one his best bowling performances in ODI cricket. He finished with four wickets in his 10 overs, giving away only 29 runs, and won the Man of the Match award for his stellar performance. But even that wonderful spell will forever remain eclipsed by the events of the last five overs in Edgbaston. The equation finally came down to this: 38 runs from 30 balls, with four wickets remaining. Lance Klusener and Pollock were at the crease, with the trusted Mark Boucher still to come. Easy. 20 runs were scored in the next three overs with the loss of Pollock’s wicket. 18 required off 12. It was still manageable but the South African edifice began crumbling under pressure. Australia were stifling the flow of runs and the tension got the better of their opponents. The first four balls of the 49th over saw two more wickets fall. 16 off 8. 1 wicket left. The Aussies were on top. Klusener was left on strike, with Allan Donald beside him. The southpaw had a reputation for being one of the cleanest strikers of the ball. He somehow shook off the choke hold and went for it in the next delivery. His aerial shot escaped Paul Reiffel’s outstretched hands as the ball crossed the boundary for a six. Another single followed to intelligently keep him on strike. Nine runs. Six balls. Last wicket. Daniel Fleming was handed the ball for the last over. Twice he ran in and twice the ball disappeared! The southpaw stepped back and drove wide of long off, the only shots ever that have done justice to Ravi Shastri’s “tracer bullet” metaphor. In just a flash, the scores were tied. Four balls left and just one run to score. Klusener still on strike. It should have been easy but that old choking disease chose that moment to strike. In the third ball of the over, Donald ran for the most suicidal single in the history of cricket. Lehmann missed a throw at the stumps and he escaped. But when the curse of choking comes calling, it doesn’t retreat after just one strike. Klusener, who had just scored 15 runs in four balls could no longer get the ball away for even a single. Though there were two balls still left, he shockingly ran for another suicidal run when he couldn’t clear the infield. It was an easy run-out and Australia qualified for the final by virtue of their earlier performances in the tournament. The defining image of the match was that of a distraught Allan Donald standing on the pitch, his bat thrown to the side. For the record, he had earlier finished with figures of 4/32 in his 10 overs. It must have been a memorable spell but that’s the thing with choking – it wipes off everything else. People only remember the failures.